This is the story of a visit deep underground in today's Berlin, the story of a journey back to a time where, the citizens of Berlin, it was a matter of surviving another day when Allied bombers bombed the city and Russian troops outside the city, pressed to get the Nazi stronghold to sink into the gravel. It is an early summer morning in <?xml:namespace prefix = st1 ns = "urn:schemas-microsoft-com:office:smarttags" />Berlin. The heavy morning traffic of buses, vans and cars filling the streets and it's an ordinary day just like any other day in the middle of this historic city. And yet it is today a special day for me. I find myself outside "Gesundbrunnen" station, which is part of the extensive network of U-Bahn and S-Bahn connections criss-crossing the city. Close to the entrance of the station on a hilltop surrounded by tall trees, I can see something that is clearly an anti-aircraft bunker from WWII. Gesundbrunnen resembles an every other station and I have just checked a second time if it was here I had to attend. I'm on holiday in Berlin with my family, which consists of daughter, son and a faithful wife, who has agreed to join me on this excursion, which for me is the highlight of this holiday. It is not the first time we are in Berlin, in fact Berlin has become one of our favorite cities in Europe and this city always has something to offer and is in many ways different than many other major cities. It is hard to understand that this city has largely been razed to the ground and literally risen from the ashes. In addition to a city which in so many ways has gone through many hardships, Berlin is also a surprising city with many interesting facets and cultural activities. Berlin was a very sophisticated cosmopolitan city back in the 30s. The city was in many areas, both technically and culturally very ahead of its time. Berlin was the place you traveled to if you would feel "the rush". Hitler had many great plans for his capital, which he austere and ambitiously planned along with his chief architect, Albert Speer. Several major projects were initiated and all looked well. Then came the war and many things changed. However, Hitler had a hidden agenda, the war could of course risk putting a very serious effect on both Berlin and other major German cities, although this could be hard to imagine for the German High Command as the Germans' forward march in Europe had the wind at their backs. Hitler had begun construction of a large number of bunkers and shelters across the city, that already had an extensive historical underground network of tunnels and caves vand reservoir. The war came and when the Germans lost control of the German sky came the many shelters and bunkers frequently in use. Most famous of them all was, of course Hitler and his stabs personal bunker below the Reich Chancellery in the center of Berlin. Initially an ordinary bunker, but after the first Allied bombing of Berlin, it was reinforced and strengthened further to provide greater protection. As everyone knows, this bunker totally destroyed by Russian troops after they had occupied Berlin. In recent excavations and construction projects around the area where the Reich Chancellery had been, remains of the original bunker system reappeared. After having photographed and created records, it was destroyed the last remnants of the historic vault so that it would not constitute a focal point for possible future Nazis. But this is not the bunker that this article is about. 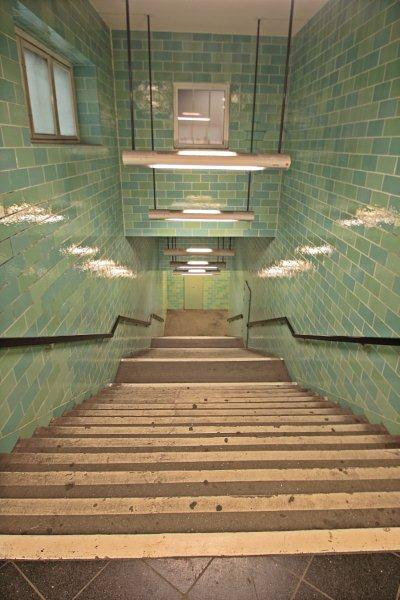 This is the article about the many public shelters, which in recent years has been opened as museums thus posterity can get an insight into how Berlin's citizens were forced to stay underground during the intense bombing during World War II. During the cold war more of these bunkers also got a role as shelters, when they lived under constant fear of a nuclear war between East and West. The time at Gesundbrunnen station is now around 10:45 and we are waiting together with a number of other tourists from various countries who apparently also has set aside a morning to visit a relic from, something that many would describe as a time of Armageddon . We have all bought tickets for a guided tour of the subterranean labyrinths deep beneath street level. A ride in "Berlinen Unterwelten". 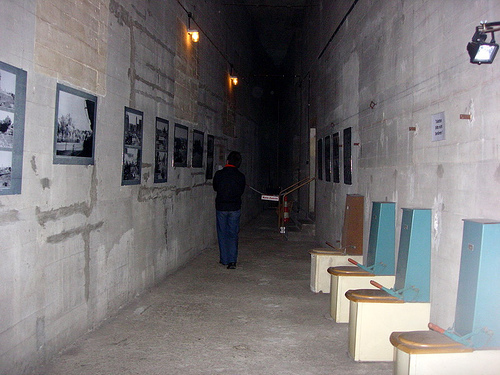 A group of historical enthusiasts established in 1997 the association "Berlinen Unterwelten" who wanted to reopen several of the sealed bunkers and shelters and give people the opportunity to see these historical sites. In 1999 they started to conduct tours and otherwise participate in excavations around Berlin. 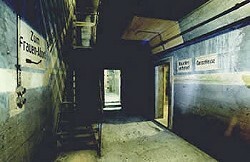 The Association even participated as consultants in connection with the film production "Der Untergang� as they needed to build a 1:1 model of the famous bunker in Rigs Chancellery. Every time you stick a spade in the soil around and in Berlin, a wealth of relics from the war appear. Everything from rusted helmets, weapons residues, grenades, ammunition and bombs for military equipment, and frequently also human bones and personal relics. At one point they even found a half rocket launcher buried in the ground. Many of these finds are now exhibited in several of these bunkers. Time is now finally 11 and a young American guy comes up and assembe us all waiting around. We are a manageable group of visitors, as they have set a limit on how many players that can participate in these tours so that everyone can get the most out of these tours. This bunker is known to be in very good condition where other bunkers often are in half ruins with signs of fierce bombardments. Our tickets have now been checked and together we go down the stairs. Halfway down we stop at an ordinary steel door. Our guide opens the door and we go further down the stairs to a landing where we are all asked to wait until the door can be closed behind us. The door is now locked and we get a short briefing by the guide where we are informed that this is the last place where we can take photos. The writing on the walls, which are mostly raw concrete, is clearly of another time and it is clear that we are now going back in time. On the wall there is a sign: "Frauen Abortion" in large letters at a door which leads off the landing. "Strange" I think. We will soon get an explanation that "Abortion" had a different meaning in the 30s and 40ernes Germany .. and this in fact led the way for female restroom. We are now beginning to embark us down the many stairs and through the various mazes. They had been able to recover a portion of the interior and it was quite interesting to see how true it all was originally constructed .. Among other things you could see how the walls were painted in fluorescent colors so that when electricity disappeared, as it often did during the many bombardments would continue to navigate in the dark by using the light from the luminous walls. Another little thought-provoking observation were the mounted toilets, which were freely available without shielding or walls. At the beginning of the war, the many bunkers and shelters have been equipped with ordinary toilets, but as the war progressed and there was a widespread hopelessness among city residents, a large number of people sadly began committing suicide in the many closets. So to avoid this growing problem, they simply removed the walls and covers so that noone could end a futile life behind shielding walls without interference from some other citicsens. Large steel doors isolated complex of shelter from the world outside, and when air alarms went running and Berlin citizens rushed to the many nearby shelters, it was to be quick as there was only room for a certain number of persons in each shelter. Generally there was not protection enough for everyone, so for each air strike, there were always people who were left out in the open without any protection other than a prayer and perhaps a nearby basement, which did not provide particularly strong protection against the heavy Allied bombings. Many citizens were killed in this way and it was an unpleasant task, to be the responsible person that should shut the heavy steel doors, while they desperately pounded on to be admitted. Often it happened that they took too many citizens in, which unfortunately got another drastic consequence during the, often, long bombings .... the people in the shelter could simply not get enough oxygen to all the people and it was not uncommon that people fainted because of lack of oxygen and it often resulted in more deaths. In an interesting and quite thought-provoking way, we were shown around the extensive network of corridors and the tour was completed by a number of showcases and plancer with the many discoveries made at construction sites around central Berlin. After visiting to the underground, we are now back up on the street level outside �Gesundbrunnen Station�. We are all silent and thoughts rushing around after this sobering experience. It's been an emotional "trip back in time", back to a crazy time where there was a big waste of civilian and military life and where many took one day at a time while neighbors and relatives often disappeared or died in the ruins of Berlin. Berlin today is again one of the major cities of the world and the town simmer of activities. It is hard to understand that this city has been able to rise again after that virtually everything has to be leveled. The Cold War was also hard on the city, but it's a completely different story that requires a lot of other interesting visits around the city. Since their beginning in 1997, the "Berliner Unterwelten" perfecting the developing of their museum work and knowledge about the remaining bunkers and complexes from WWII. We often receive a public reminder and a better understanding from relics from the period before 1945 often pop up often in connection with new building complexes. One of the more special was in connection with excavations in central Berlin in 2010, when a closed basement room close to "The Rote Rathaus" at the Brandenburg Gate showed up and where was found the farthest lost art, previously banned by Hitler, also known as "Degenerate Art ". A Jewish family had been able to secure a lot of the art that Hitler sent on tour around Germany and would later be hidden away so no one could take in a visit. There was a hole in the German art history as it was supposed that everything had been destroyed and lost for posterity. Suddenly, one could now exhume these forgotten works of art, as Germany got the opportunity to fill these black holes of European art history out.